"Reader! if thou are thankful to God that such a Man lived, Pray for the Christian World, That neither the Pride of false Learning, Nor the Growth of Unbelief, May so far prevail As to render his pious Labours in any degree ineffectual." ...while the Microcosmic man, Adam Kadmon, is stretched upon the celestial cross in the heavens. Parsons states, the Nativity 6 B.C., with the life of Jesus at 33-1/2 years, and the Crucifixion at 29 A.D. He also has the Deluge at 2123 B.C.. While Latch states, the Nativity 1 B.C., with the life of Jesus at 33 years 9 months, and the Crucifixion at 34 A.D. And Latch has the Deluge at 2241 B.C..
" 'The assumption of our geologists seems incontrovesible, that the human race must have survived a "mighty transformation of at least the greater portion of our planet" — (Wagner.) The notes prepared on this point have assumed such proportions that they must be reserved for a separate work entitled, 'The Lost Pleiad; or, the Fall of Lucifer the Key to the Solar Myths and the Origin of all Known Forms of Religion.' The conclusion developed by the testimony gathered being that in Christianity, far from 'something small and local,' we possess the religion of Prehistoric Man, and that it is now being reestablished upon its ancient intellectual foundations largely by the involuntary agency of Modern Science." After several years of research and comparison, and classification of results, it became apparent that an exhaustive treatment of the vast subject would involve a new universal synthesis rivalling in its proportions the Synthetic Philosophy of Herbert Spencer. The attempt to execute such a work being out of the question for one actively engaged in professional life, a point of departure was sought for the consecutive presentation of some of the most striking facts brought to light by these investigations. 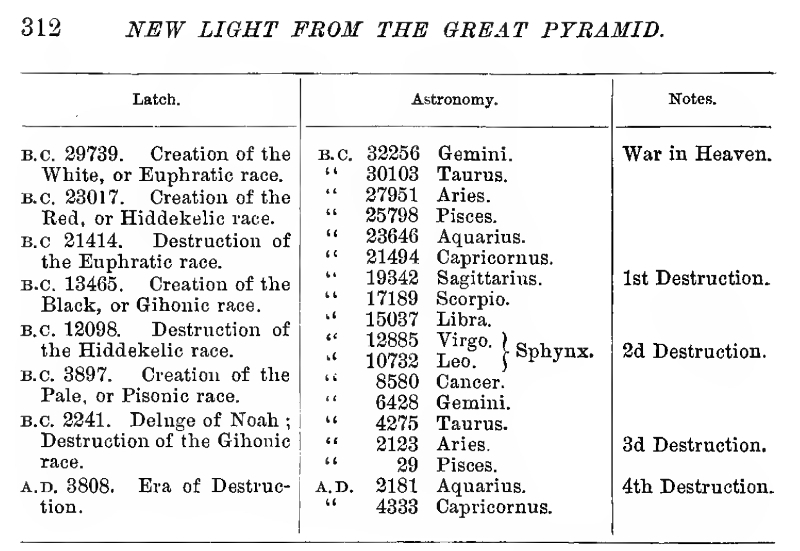 Such a point of departure subsequently appeared as a result of a most surprising and unexpected discovery with reference to the Great Pyramid, viz., that it forms the connecting link between the Astronomy and Geography, and at the same time between the Religion and the Science, of the ancient world. Attempts to reconstruct the long-fallen arch of prehistoric science, art, and religion have not been wanting in the past. Should the present work prove successful where its predecessors have failed, namely, in indicating the right line of effort for the restoration of the long-broken continuity of human consciousness between historic man and his prehistoric ancestors, that success will be largely due to the discovery that, in the Great Pyramid mankind possesses the veritable keystone of that arch, whose broken fragments have been the wonder and the enigma of ages. "If the proposition which you advance" wrote a professional man to whom was submitted a brief abstract of the contents of the present work, "can be shown to have scientific basis, it is undoubtedly one of the greatest possible interest to all mankind." The author does not presume to attach such importance to any conclusions to which his mind has been led by the testimony of historic facts in evidence; the facts themselves he can but consider of supreme interest. With extraordinary Light and Truth. As to render his pious Labours in any degree ineffectual. In the 69th year of his age." The two learned Lexicons of Parkhurst have long disappeared from public use in the study of the Bible, not because they have been improved upon in their characteristic feature of widest catholicity of learning, but because the Lexicons which have supplanted them are based upon a diametrically opposite principle, namely, the ignoring of all points of contact between Hebrew and classic literature. In his Lexicons, Parkhurst writes, "not only the Lexicographers and Verbal Critics, but the more enlarged Philologists, the writers of Natural and Civil History, Travellers, ancient and modern, into the eastern countries, and even the Poets, have been made to draw water for the service of the Sanctuary, or to contribute their quotas to the illustration of the Hebrew scriptures." Logic teaches that it is impossible to know anything apart from its relations to other things, both similar and dissimilar. Comparative anatomy in religion no more disproves the existence of the vital element of religion than comparative anatomy in physiology disproves the fact or explains the mystery of life, but comparative anatomy throws a flood of light upon the laws governing the birth, growth, and death of the physical or visible organization alike of religions and of men. To doubt the fidelity to Christianity of a thinker solely because he has studied comparative religion, is like doubting one's belief in humanity as distinguished from the brute creation, because he has investigated the points of similarity and dissimilarity between the human species and the various types of the animal kingdom from mollusc to ape. That there is in religion something to investigate, the briefest consideration will make manifest. Obviously, religion has both form and substance, as an egg has shell and contents. But a bird, deprived of calcareous nutriment, cannot provide shells for her eggs. It does not follow from this, however, that the carbonate of lime originates either bird or eggs; still less does the fact that the bird turns the lime to account explain the origin of the lime itself. * In respect alike to theology, scriptures, rites, ceremonies, and forms, Christianity has built its shell from the same material used for similar purposes by numerous extinct or still surviving religions. But this fact neither identifies Christianity with those rites and religions, nor accounts for the origin of the material which all alike have used, each after its own fashion. Divested of its shell, Christianity certainly retains all that existed in the days of Christ and his disciples, before the accretions of subsequent centuries had formed and hardened around it, namely, its soul and spirit, which alone are immortal. The present desperate determination to cling to the shell is a sheer materialism and idolatry — is, indeed, the real heresy which neither discerns the being of an indestructible spirit nor trusts its sole saving power, Schopenhauer declares ("World as Will and Idea," iii., p. 447): "There is nothing in which one has to distinguish the kernel from the shell so carefully as in Christianity. Just because I prize the kernel highly, I sometimes treat the shell with little ceremony; it is, however, thicker than is generally supposed." Meanwhile, the examination of this material, worked over in so many ways since the most ancient times, proves of the highest importance, since it discloses new chapters in the history, not only of mankind and of the globe we inhabit, but of the solar system. This history we should seek to recover in its entirety and to preserve. A man betrays his doubt of the genuineness of his religion or the honor of its ancestry when, for fear of revelations and discoveries, he proposes to stop historic research. Even for the Incarnation human cooperation was necessary; otherwise the Messiah would not have been the Son of man. Nor could Christianity have had being save through previously existing forms of religion. The gospel could and can be preached only by means of words whose religious significance was determined before that gospel was proclaimed. To set forth a new system of mathematics, language already established and understood as mathematical must be employed. This fact is frankly recognized in the Bible when the genealogy of the Christ is given, the line of ancestors containing many names synonymous with one or another of all the crimes condemned in Holy Writ. Why, then, should not Christians study the sources of Christianity on its human historic side? The reader will find no symmetrically ordered system in this book. Had it been based upon a theory, every topic and Section would have been developed in rigidly logical order, but since it had its origin in an investigation, the reader is conducted along the path by which the author went in gathering facts. What is lost in logical order, however, is perhaps more than gained in climax, while, beginning with Taurus and ending with Aries, the mind follows, as in panoramic display, the zodiacal signs through the 360 celestial degrees, and observes, sign by sign, the reflection of the story of the stars above in the nomenclature, the faiths, the mythology, and the heraldry of the lands occupying the corresponding 360 meridians below. When we hear of the growls of the Russian Bear, or of the flapping of the wings of the American Eagle, we recognize at once the familiar heraldic emblems of the Russian empire and the American republic. So far, however, as the present writer has been able to ascertain, it has never before been shown, that a prehistoric universal astronomico-geographical system allots the only bears set in the stars to Russia and the only eagles to America. This system also displays the zodiacal constellation of Taurus over the Taurus Mountains, Perseus, over Persia, Orion over Iran, Medusa over the land of the Medes, the British Unicorn between the meridians of British India, Capricornus-Pan over Panama, Cygnus-Canaan over Canada, the Ram or Lamb of Gad over Rome, and the flaming Lion over China. This flaming Lion, though now a familiar figure in bric-a-brac and art shops, in bronze, porcelain, chinaware, or wood, offers apparently an exception to the coincidences existing between the skies and the different quarters of the globe, since the Lion brings our thoughts rather to Great Britain than to China. The exception, however, is only apparent. The Lion belongs to China in the first place by virtue of prehistoric astronomical allotment, the constellations as we know them being described by Hesiod, 1000 B.C., as, even at that period, of immemorial antiquity, whereas the appearance of the Lion in the British Isles dates from a comparatively recent period; secondly, history, tradition, and philology unite in indicating Noah or one of his sons as the founder of the Chinese Empire, with its patriarchal characteristics, while the Anglo-Saxons are not the original inhabitants of the British Isles, but an invading race. Precisely how, when, and why the British came into possession of the Lion of China and the Unicorn of India are points that remain to be elucidated, but it may confidently be expected that the discovery set forth will prove the long-lost key to the origin and significance of the British arms and of ancient heraldry in general. Surely it is a significant discovery that during the reign of the first English Empress of India the British Unicorn is found inseparably associated with the land of India. It would seem moreover that the stars connect England with the Crimea, for the constellation Taurus is the Bull, and John Bull is the British Empire, while the Crimea is situated between the meridians of Taurus, and its ancient inhabitants, the Scythian ancestors of the Saxon race, are still indicated upon all classical maps as the Tauri or people of the Bull. Study of the American constellations Scorpio, Sagittarius, and Capricornus, reveals the immemorial antiquity of the name of America, and the significance of the arms of the United States. The fact once recognized that it is impossible to separate the Eagle from America — the "land shadowed with wings" of Isaiah, over which accordingly appear two grand eagles, the red swan flying down the milky way, and the winged steeds, Pegasus, and Equleus, all the wings known to astronomy — without taking the Bear from Russia, Perseus from Persia, and a flood of light is poured upon the history and mythology; and where heretofore much has been vague and inscrutable, now we are able at least, to see men, as trees, walking. The map accompanying this work is arranged so that the reader may keep it continually before his eyes for the purpose of reference, as he is led through the examination of a network of coincidences, which if accidental would prove that chance is as artistically methodical in its operations as law itself. When, following the course of the constellations, those immovably and perpetually fastened upon America are reached, it will appear that, while all that is sublime in the historic past centres upon Egypt, all that is sublime in the prehistoric past centres upon America; and as the curtain which has hitherto concealed the prehistoric connection between the peoples of ancient Egypt and of America, is lifted, it will be seen that, the people of the Eagle on the Nile being descended from the original people of the Eagle on this Continent, the twain are one, and that prehistoric America was the original Egypt or Eagleland, prior to the mighty dispersion in the days of Peleg, when the earth was divided and the great globe itself was nearly rent asunder. "First-born among the continents," says Agassiz, "America has been falsely denominated the New World. Hers was the first dry land lifted out of the waters, hers the first shore washed by the ocean that enveloped all the earth beside: and while Europe was represented only by islands rising here and there above the sea, America already stretched in an unbroken line of land from Nova Scotia to the far West." That ancient America, as we shall see, was inhabited by the grand race of men whose deathless traces have been left upon the surface of the globe and among the stars of the sky. When in the course of the following pages the key of the Great Pyramid, which forms the reverse of the great seal of the Secretary of State of the United States, is applied "to unlock the mystery of long-submerged islands and long-depopulated lands, and cause them to lift up their voices to tell of the feet that once moved in choral dances upon their level floors," it will appear that "the science of that ancient time was as the flight of the eagle, while that of our present civilization is but as the burrowing of the mole." All the heraldry of the nations, it will be shown, and all the emblems, ceremonies, and figures of speech of religion and of epic poetry, are derived from the art and the science, the triumph and the destruction of the ancient Americans. Sir Daniel Wilson remarks that, like Brasseur, Donnelly, in his "Atlantis, the Antediluvian World" wholly ignores the concurrent opinions of the highest authorities in science that the main features of the Atlantic basin have undergone no change within recent geological periods." Brasseur and Donnelly, resorting "to the law and to the testimony," present an invincible chain of facts transmitted from prehistoric times by the immediate descendants of the races who experienced the events they describe. Why should not they ignore mere opinions of today, based upon geological theories of the orderly course of nature as demonstrated in the laboratory experiments of scientists who will perceive in the terrestrial effects of the one dreadful night of Isaiah and of Plato, only changes gradually produced in the slow course of unnumbered hundreds of thousands of years? Certainly, scientists who, from the marks left by the Johnstown flood, should figure out geological periods of thousands of years for the "natural" production of the effects observed, would deserve to have their "concurrent opinions" ignored by students of descriptions left by eye-witnesses of the disaster. The promulgators of such concurrent opinions know that, if all ancient Bibles and all religions bear witness to historic truth, their modern geological theories are false; hence their eagerness to persuade the people to exchange their old lamps for new, to surrender the facts of human history for new-found scientific opinions. "Nay, I'll show you the manner of it: this shoe is my father; no, this left shoe is my father; no, no, this left shoe is my mother; nay, that cannot be either. I am the dog; no, the dog is himself, and I am the dog: Oh, the dog is me, and I am myself. Ay, so, so. Now come I to my father." When I was shown the charts and diagrams, to add, divide and measure them. No matter how numerous or complicated the wards of a lock may be, if but the right key be applied, The Great Pyramid proves to be the long-sought key to the mysteries at once of, mythology and of the great world religions. Especially interesting is it to Americans this year of the Columbian celebration of the four hundredth anniversary of the rediscovery of America (1893), to see it demonstrated that the cosmic terrors interwoven with the very warp and woof of all sacred literature, Christian and pagan, refer to occurrences as literally true as the earthquake of Lisbon, these stupendous events being connected primarily with a great destruction and recovery of equilibrium in the solar system; and secondly with the consequent wrecking of the continent of America when the globe became involved in the consequences of the disorder of the skies. America, when this ruin befel, was the seat of the greatest empire that has ever existed, and its irresistible armies were terrorizing all Europe and Asia. In America rediscovered in the fifteenth century and repopulated in the seventeenth was recovered Egypt and the promised land, or the land of the constellation of the Eagle (Aquila, Egyptus) and the Swan (Cygnus Canaan, Canada), whose places will be shown to be fixed in America by the same combination of celestial and terrestrial geography which gives to Russia the Bear, to China the Lion, to British India the Unicorn, and to the Great Pyramid the Pleiades, with which constellation that gigantic Bible in Stone is directly connected by Herschel, Proctor, Smyth, and other of the foremost astronomers. This one fact renders it strikingly appropriate that the first Parliament of Religions in the history of the world should have been held on American soil, thus bringing together brethren long separated upon the identical continent occupied by their common progenitors before the confusion of lip and tradition wrought by the separation of the survivors of the supreme disaster which wrecked this continent, and buried its civilization beneath the so-called drift deposits of the alleged glacial period. May this volume aid at least individuals among those who thus met at the Columbian Parliament, to find common ground for future welcomes and greetings more fervent than any inspired by patronizing attitudes, or the whilom toleration of an armed truce and temporary suspension of hostilities. The events which took place during the year in ancient Egypt throw light upon the names of the zodiacal constellations, if we move them back to the positions they occupied about fifteen thousand years ago. The Euphratean name on the cuneiform inscriptions, for the month occupied by Capricornus, was "Father of Light," on which Sayce remarks, "It is difficult to understand how it can have been called a month of light." Fifteen thousand years ago, however, Capricornus, instead of being as now near the lower solstice, was near the higher solstice, where the sun reaches his highest position in the heavens, so that the period of Capricornus was truly a month of light, which it could not have been at any other period than fifteen thousand years ago. Exhibits in over fifty diagrams from Genesis alone, a reach of 31,863 years. Mr. Latch's premises are derived exclusively from the King James translation of the Bible, and his conclusions are given without reference to either profane history, tradition, or astronomy. Yet the most remarkable agreement exists between Latch's chronological epochs and allegories of Scripture, and the precession of the equinoxes through the signs of the Zodiac. When, therefore. Latch, from Scriptural premises solely, is led to place the era of the Great Pyramid at between B.C. 12098 and B.C. 13465, it is at all events a striking coincidence that at that period, in the place of the inconspicuous Alpha Draconis, we should have as the then correlative of Alcyone of the Pleiades in the Pyramid co-ordination, the brilliant star of the first magnitude called Vega, which ranks as high as fifth among the fifteen largest stars known to astronomy. *For a long time, the facts disclosed by the foregoing researches, made strongly for the views of eminent divines whose teachings and whose character have been and are most helpful to the author. Subsequently he was pained to find that the trend of facts was toward conclusions, not indeed at all irreligious or atheistical, but certainly so different from, and as the author conceives, so much vaster, broader, and higher than the received standard teachings of the different wings of the Church, that, at least at first sight, they are sure to disquiet and pain, nay probably offend outright some of the very divines toward whom the author still feels most appreciatively grateful. For this untoward result there was, however, no help. An investigation once begun cannot be terminated either as, or when, one will. The student can only make his peace with the Source of Truth—for not even the most adroit special pleading would enable him at all times to please all the representative men of all the various religious deuominations, whom personally he most sincerely honors. There would seem to be only one explanation possible of the immense range of historic facts here touched upon, and that explanation is that conscious law is king; or, in other words, that "there is a Divinity that shapes our ends, rough hew them how we may." The remark of Hawken has already been cited, that, "Throughout the world, and for all time, the land itself possesses a physical or psychical essence conformable to the serial arrangement of the tribes" -(i.e., The Zodiacal Signs). Thus the federal union of the Anglo-American colonies was foreshadowed by the system of the great Onondaga chief, which was not a transitory league but a permanent organization. Says Wilkinson: "It is remarkable that the influence of the vegetable world upon climate should be admitted, and that no influence of the human world of a similar but higher kind should be suspected. Are thought-movements and will-movements sooner absorbed than sound - movements? Do they sculpture the air with less efficiency? Or in what do their modifications end? Is the music of man's brains and lungs of no Orphic power in the tenseness of God's created harmony? The Eddas and poetries bind mankind into sheaves, being as common respirations or great world tunes, the sum of beginnings of musical acts from the sailors upon the river of time. The material breath falls in dregs which soon pass away, while the mental breath endures we know not how long; for, as the poet says of the Forum, ' Still the eloquent air burns, breathes, with Cicero.' " —("Human Body and its Connexion with Man."). If this be true, and if history thus repeats itself, what moral can the America of the present draw from the America of the past? Plato's description of the people ruined by Deity gives us an impressive suggestion. He writes that "For many generations the people were obedient to the laws, and possessed true and in every way great spirits, practising gentleness with one another. They despised everything but virtue, thinking lightly of the possession of gold, nor did luxury intoxicate them, nor wealth deprive them of self-control." [The era of Mercury ?] ''But when this divine portion began to fade, and human nature got the upper hand, then to him who had an eye to see they began to appear base, though outwardly they still appeared glorious and blessed, at the very time when they were filled with unrighteous avarice and power." [The era of Mars ?] "Whereupon Zeus, who rules with law, perceiving that an honorable race was in a most wretched state, inflicted punishment upon them." It is written in the stars that America, the ancient land of Mercury and Mars, shall ever be foremost in commerce and invincible in war. Nevertheless, may the republic, instead of wantonly aggressing against other nations, enjoy prosperity without selfishness, and in place of avarice, cultivate and represent the original gentleness, peacefulness, wisdom, and greatness of spirit of her ancient predecessors on this sacred soil. Conclusion of this review, will show, that the Ages of Man did in fact exist prior to the flood. We are in a school on this planet, to test the inherences of Divine Sparks and Evil Sparks to your "unblemishable body". The Timeline of the Ages resides in this book, and closely follows the Mosaic Chronology of the reserach of our Edward. Have a look, and prepare wisely your path forward. For the End is Near. Latch shows thru the elucidation of the King James 1860 Bible, 31,754 B.C., as the War in Heaven. Only a 393 year difference from Parsons. Parsons shows the Deluge at 2123 B.C. Latch states thru the Codex Argenteus, 2241 B.C., a 118 year difference. Parsons shows fourth destruction at 2181 A.D.. Latch says destruction (Judgement) can happen at any time after about 2133 A.D., a 48 year difference. Take notice please.